Following on from the conclusion of the Sports Festival it's back to class for the students of U.A. High School, as the hugely popular My Hero Academia returns. The second volume contains episodes 13-25 of the second season, which originally aired (and streamed on FunimationNow and Crunchyroll) between June and September of 2017. While the first half of this season was dedicated to the U.A. High Sports Festival, the latter half contains a much wider variety of stories. First, it's time for the students to pick their Hero Names. Then, it's time for the students to take part in internships with established heroes or agencies. Izuku "Deku" Midoriya is partnered with Gran Torino, who was once the mentor of All Might. Things take a turn for the more dramatic (and life-threatening) when Deku, Tenya and Shoto encounter the Hero Killer, Stain. Returning to school, it's time for the students to face their final exams. This time, Deku and his classmates are up against their biggest challenge yet- as the exams pit them against their own teachers. 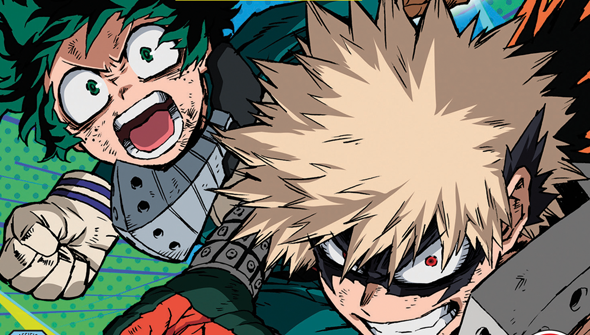 And of course, for maximum dramatic impact, who must Deku face? None other than his own mentor, All Might! The Sports Festival arc was fun enough, but the second half of the season has more to offer. The internship storyline is a clever way to give different characters the spotlight and see them show off their skills outside of the school setting. It also really helps expand the show's world. The arrival of Stain kicks it up a gear, and the showdown between him and a group of our heroes is definitely among the highlights of not only the season but also of the whole series so far. It's definitely the highest the stakes have been since the League of Villains attacked at the end of season one. The internship arc closes out with an anime-original episode which allows us to catch up with what other cast members have been up to while this has been going on. 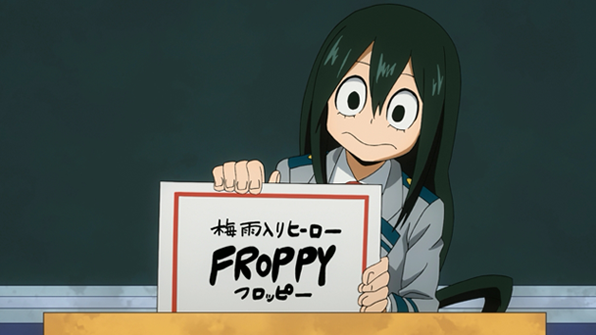 Much of this is focussed on fan-favourite frog-girl Froppy, who teams up with a (literal) Navy Seal hero to take down smugglers. Your work experience was never like this. Back on campus, the practical exams are also hugely entertaining, and a rare chance for us to the see the UA Faculty staff showing off their skills. While Deku facing off against All Might is certainly the most dramatic and impactful, fans will surely get a kick out of seeing just what the eccentric Principal can do, too. Unlike other much longer-running Shonen Jump inspired series, My Hero Academia is released in distinct seasons (with breaks in between). This is working very much in the show's favour, allowing for much higher production values and avoiding the need for the dreaded filler-material. On the localisation front, this is a typically polished dub from Funimation. For fans of this version of the series, the Blu-Ray is definitely worth picking up, as it comes with some pretty extensive features delving into the production of the English version. It also includes some interviews, and "Inside The Episode" featurettes. And of course- the HD version allows the series to look and sound its absolute best. 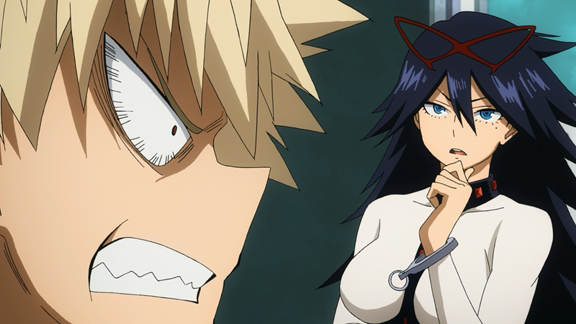 My Hero Academia continues to prove just why it has become the next big thing in anime. Engaging characters, exciting action and beautiful animation from BONES mean that this is a series which is appealing across the board. Combining the best of Shonen tropes with an influence from Western superhero traditions, it makes for quite the thrilling combination. IN A NUTSHELL: Super-Fun, Super-Cool and Super-Entertaining, My Hero Academia is top of the class.